A healthy diet is basically include a variety of foods such as vegetables, fresh fruit, cereals, whole grains and light protein (fish, chicken, eggs). 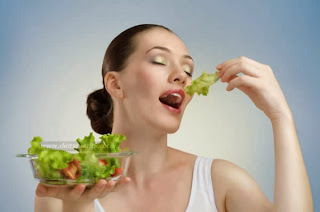 But for women over age 30 that she wanted to diet, need some special foods that are rich in vitamins and protein. These foods are important to fight disease, maintain fertility, and most importantly, overall body health. If you are aged 30 years or older and want to lead a healthy diet, follow these tips. Fruits are eaten raw provide adequate nutrition for women over 30 years, where at this age, they need more iron and calcium. Enter papaya, peach, strawberry, orange and cranberry in your daily menu. These nutrients will benefit more leverage to the body if taken with Vitamin D and magnesium. Choose dairy products (cheese, yogurt) is low in fat. Diligent also eat spinach, grilled salmon or tuna, eggs, skim milk and whole grains are rich in calcium. Animal protein in the body to absorb calcium, so it should reduce their consumption. In lieu of protein, choose from the vegetable such as tofu, grains and broccoli. Each month, many women lose iron from the body due to menstruation. Iron deficiency will make your body weak and reduces the formation of red blood. Therefore, eat iron rich foods to combat fatigue, prevent anemia, hair loss and headaches. Green leafy vegetables like spinach, asparagus and whole grains are the best source of iron, as well as chicken liver and tuna fish. To reduce the bad cholesterol, women 30 years or more should be adequate intake of unsaturated fats. This type of fat protects you from heart disease, lowering blood sugar levels and high blood pressure. Healthy fats also increase the formation of red blood cells and blood circulation in the body. Almonds, cashews, oatmeal, pasta, bread wheat, sesame and pumpkin seeds are a source of healthy fats. So also with vegetable oils of olive, canola and grapeseed.